I created this card using Design Studio and the frog from Paper Dolls. He's the princess' frog on page 47. By welding the frog I was able to eliminate the detail cuts. I also hid the eyes so they wouldn't cut by clicking hide. Hoppy Birthday is from Lyrical Letters. At 1 inch this was way too delicate to work with. I'd prefer a more sturdy font in the future. 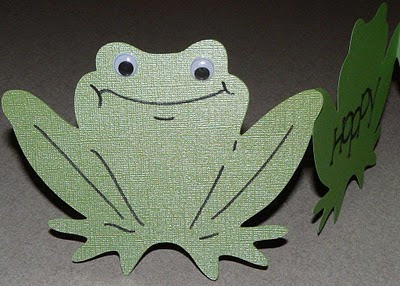 The front of the card is the same frog glued over the base in the pearly green textured paper. The base of the card is made with a green paper I had on hand out of a unknown pack. The front was made with Core-dinations from J's. Gemstone's "Jade" I cut the base paper to 6x12 and then used double sided tape to make a strip of paper 6x23.5" long. The entire folded card was cut out at one time. The Cricut cut through all the layers pretty cleanly. 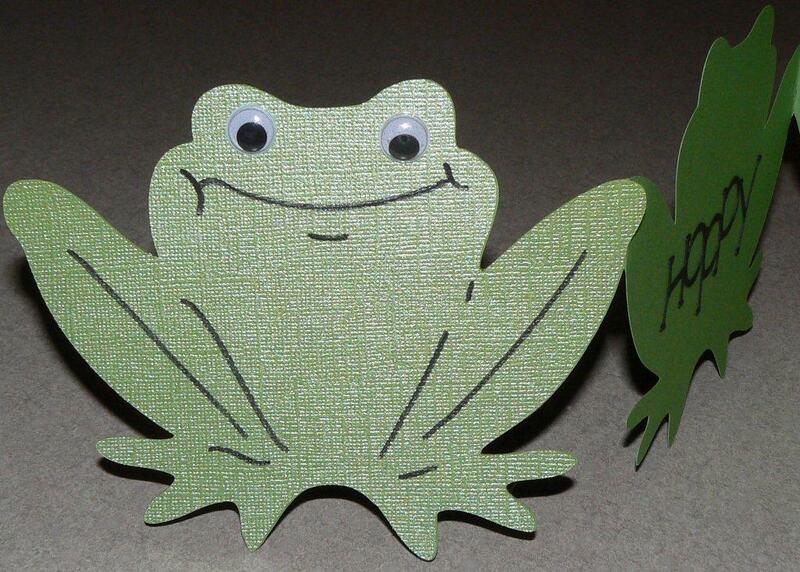 A couple googley eyes and an upturned smile that I filled in with a marker turned him into a very happy frog.